"Signal theory" redirects here. It is not to be confused with Signalling theory or Signalling (economics). Signal transmission using electronic signal processing. Transducers convert signals from other physical waveforms to electric current or voltage waveforms, which then are processed, transmitted as electromagnetic waves, received and converted by another transducer to final form. The signal on the left looks like noise, but the signal processing technique known as the Fourier transform (right) shows that it contains five well defined frequency components. Signal processing is a subfield of mathematics, information and electrical engineering that concerns the analysis, synthesis, and modification of signals, which are broadly defined as functions conveying "information about the behavior or attributes of some phenomenon", such as sound, images, and biological measurements. For example, signal processing techniques are used to improve signal transmission fidelity, storage efficiency, and subjective quality, and to emphasize or detect components of interest in a measured signal. According to Alan V. Oppenheim and Ronald W. Schafer, the principles of signal processing can be found in the classical numerical analysis techniques of the 17th century. Oppenheim and Schafer further state that the digital refinement of these techniques can be found in the digital control systems of the 1940s and 1950s. Continuous-time signal processing is for signals that vary with the change of continuous domain(without considering some individual interrupted points). Digital signal processing is the processing of digitized discrete-time sampled signals. Processing is done by general-purpose computers or by digital circuits such as ASICs, field-programmable gate arrays or specialized digital signal processors (DSP chips). Typical arithmetical operations include fixed-point and floating-point, real-valued and complex-valued, multiplication and addition. Other typical operations supported by the hardware are circular buffers and lookup tables. Examples of algorithms are the Fast Fourier transform (FFT), finite impulse response (FIR) filter, Infinite impulse response (IIR) filter, and adaptive filters such as the Wiener and Kalman filters. Statistical signal processing is an approach which treats signals as stochastic processes, utilizing their statistical properties to perform signal processing tasks. Statistical techniques are widely used in signal processing applications. For example, one can model the probability distribution of noise incurred when photographing an image, and construct techniques based on this model to reduce the noise in the resulting image. Financial signal processing – analyzing financial data using signal processing techniques, especially for prediction purposes. ^ Roland Priemer (1991). Introductory Signal Processing. World Scientific. p. 1. ISBN 9971509199. ^ Sengupta, Nandini; Sahidullah, Md; Saha, Goutam (August 2016). "Lung sound classification using cepstral-based statistical features". Computers in Biology and Medicine. 75 (1): 118–129. doi:10.1016/j.compbiomed.2016.05.013. ^ Alan V. Oppenheim and Ronald W. Schafer (1989). 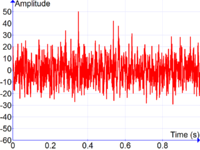 Discrete-Time Signal Processing. Prentice Hall. p. 1. ISBN 0-13-216771-9. ^ Oppenheim, Alan V.; Schafer, Ronald W. (1975). Digital Signal Processing. Prentice Hall. p. 5. ISBN 0-13-214635-5. ^ Billings, S. A. (2013). Nonlinear System Identification: NARMAX Methods in the Time, Frequency, and Spatio-Temporal Domains. Wiley. ISBN 1119943590. ^ Scharf, Louis L. (1991). Statistical signal processing: detection, estimation, and time series analysis. Boston: Addison–Wesley. ISBN 0-201-19038-9. OCLC 61160161. ^ Anastassiou, D. (2001). Genomic signal processing. IEEE. ^ Boashash, Boualem, ed. (2003). Time frequency signal analysis and processing a comprehensive reference (1 ed.). Amsterdam: Elsevier. ISBN 0-08-044335-4. ^ Stoica, Petre; Moses, Randolph (2005). Spectral Analysis of Signals (PDF). NJ: Prentice Hall. P Stoica, R Moses (2005). 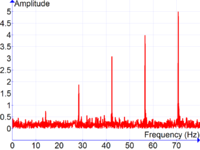 Spectral Analysis of Signals (PDF). NJ: Prentice Hall. Kay, Steven M. (1993). Fundamentals of Statistical Signal Processing. Upper Saddle River, New Jersey: Prentice Hall. ISBN 0-13-345711-7. OCLC 26504848. Papoulis, Athanasios (1991). Probability, Random Variables, and Stochastic Processes (third ed.). McGraw-Hill. ISBN 0-07-100870-5. Kainam Thomas Wong : Statistical Signal Processing lecture notes at the University of Waterloo, Canada. Ali H. Sayed, Adaptive Filters, Wiley, NJ, 2008, ISBN 978-0-470-25388-5. Thomas Kailath, Ali H. Sayed, and Babak Hassibi, Linear Estimation, Prentice-Hall, NJ, 2000, ISBN 978-0-13-022464-4.